Captain Ilsley, Charles S.: Commanding troop. First Lieutenant Sickel, Horatio G.: On leave of absence since Sept. 19, ’90 per paragraph II Special Order 129 Headquarters Department of Missouri Sept.16, ’90, and is extended per paragraph 3 Special Order Headquarters of the Army, Adjutant General’s Office. Oct 21, ’90 further extended 3 days per paragraph 7 Special Order 257 Headquarters of the Army Adjutant General’s Office, Nov. 3, ’90. Rejoined troop Nov. 5, ’90. On duty with troop. Second Lieutenant Rice, Sedgwick: On leave of absence from Nov. 6 to Nov. 22, ’90, per paragraph II Order 153 Headquarters Department of Missouri Nov. 4, ’90. Sick in quarters from Nov. 27 to Dec. 4, ’90, contusion right knee contracted in line of duty. On duty with troop. First Sergeant Clark, Charles M.: Enlisted on 30-Aug-88 at Fort Meade, Dakota Territory, by Lt. Bracom. Entitled to Re-enlisted Pay! Sergeant Whitbeck, Lot: Enlisted on 28-Aug-86 at Jefferson Barracks, Missouri, by Lt. Craig. On detached service at Fort Riley, Kans. Since Nov. 24, ’90 in charge of post garden per paragraph 2, Order 207 Ft Riley, Kansas Sept. 19, ’90. ¥ Sergeant Austin, William G.: Enlisted on 24-Jan-87 at New York, New York, by Lt. Wheeler. On furlough from Sept. 5 to Nov. 4, ’90 per endorsement Headquarters Department of Missouri Aug. 25, ’90. Joined troop at Fort Riley, Kansas, Nov. 4, 1890. Granted a Medal of Honor. * ¥ Sergeant Tritle, John F.: Enlisted on 11-Sep-88 at Baltimore, Maryland, by Capt. Huggins. Sick in Hospital “severe perforating gunshot flesh wound, right shoulder.” Wounded in engagement with Hostile Sioux Indians Dec. 29, ’90 at Wounded Knee Creek S. Dak. Granted a Certificate of Merit June 18, ’91. Corporal Shaw, Robert B.: Enlisted on 4-Jan-90 at Philadelphia, Pennsylvania, by Capt. Dodd. Entitled to Re-enlisted Pay! Corporal Healy, Thomas: Enlisted on 26-Apr-86 at Boston, Massachusetts, by Capt Ewers. Corporal Glennon, James: Enlisted on 8-Jun-89 at Camden, New Jersey, by Lt. Heyl. Corporal Johnson, Andrew: Enlisted on 26-Mar-88 at Davenport, Iowa, by Lt. Lovell. Relieved from daily duty Post Canteen Nov. 24, ’90. Appointed Corporal from Private per Order 89 Headquarters 7 Cav December 8, ’90. Trumpeter Fries, Elmer: Enlisted on 3-Aug-88 at Philadelphia, Pennsylvania, by Lt. Scott. Trumpeter Myers, Allen: Enlisted on 26-Jul-90 at Boston, Massachusetts, by Capt. Kendall. Assigned to troop to date Nov. 28 per Order 88 Headquarters 7 Cav at Pine Ridge Agency, S. D. Dec. 6, ’90. Appointed Trumpeter from Private per Order 18 troop Dec. 13, 90. Joined troop at Camp at Pine Ridge Agency, Dec. 6, ’90. Due U.S. Laundry 25 cents. Farrier Sheridan, Joseph B.: Enlisted on 27-Jul-88 at Camden, New Jersey, by Lt. Heyl. Blacksmith Sutor, Oliver: Enlisted on 28-Oct-90 at Baltimore, Maryland, by Capt. Hamilton. Assigned as horse shoer to troop per telegraphic instructions dated Headquarters Recruiting Station Dec. 12, 90. Joined troop at Pine Ridge Agency, S. Dak. Dec. 17, ’90. Appointed Blacksmith from Private per Order 19 troop Camp at Pine Ridge Agency, S. D. Dec. 18, 90. Due U.S. Laundry 22 cents. Wagoner Humphreys, Michael J.: Enlisted on 26-Mar-90 at Brooklyn, New York, by Capt. Boyle. Appointed Wagoner from Private to date Nov. 1, per Order 16 troop, Ft. Riley Kans. Nov. 10, 90. Private Allen, William: Enlisted on 31-Dec-89 at St. Louis, Missouri, by Capt. Kauffman. Assigned to troop to date Nov. 28 per Order 88 Headquarters 7 Cav at Pine Ridge Agency, S. D. Dec. 6, ’90. Joined troop at Camp at Pine Ridge Agency, S. Dak. Dec. 6, ’90. Private Arrick, Clarence S.: Enlisted on 5-Sep-88 at Cleveland, Ohio, by Capt Kellogg. Reverted from Trumpeter to Private per Order 18 troop Camp at Pine Ridge Agency, S. Dak. Dec. 13, ’90. Private Becker, Henry B.: Enlisted on 1-May-88 at Detroit, Michigan, by Capt Loud. Relieved from extra duty by verbal order of post commander. Private Beard, James H.: Enlisted on 17-Aug-88 at Chicago, Illinois, by Capt Goodwin. Relieved from litter bearer by verbal order of post commander. Private Caldwell, Eugene S.: Enlisted on 25-Apr-89 at Philadelphia, Pennsylvania, by Lt. Dodd. Private Carroll, Peter C.: Enlisted on 16-Aug-88 at Springfield, Massachusetts, by Capt. Ropes. Relieved from litter bearer by verbal order of post commander. Private Clark, Charles F.: Enlisted on 21-Feb-89 at Cleveland, Ohio, by Capt. Heiner. To forfeit to the U.S. $2.00 of his pay per Order 53, Fort Riley, Kans. Nov, 12, ’90. Deducted Nov. Rolls ’90. Private Cook, Charles: Enlisted on 21-Mar-88 at Baltimore, Maryland, by Capt. Huggins. Relieved from daily duty by verbal order of Post Commander. Private Curren, Patrick J.: Enlisted on 17-Aug-88 at Boston, Massachusetts, by Capt. Miller. To forfeit to the U.S. $2.00 of his pay per Order 53, Fort Riley, Kans. Nov, 12, ’90. Deducted Nov. Rolls ’90. Private Davis, Joseph A.: Enlisted on 12-Nov-88 at Newark, New Jerey, by Lt. Carter. ¥ Private Feaster, Mosheim: Enlisted on 23-Oct-89 at Cleveland, Ohio, by Capt. Carpenter. To forfeit to the U.S. $3.00 of his pay per Order 255, Ft. Riley, Kans. Nov. 14, ’90. Deducted Nov. Rolls ’90. Granted a Medal of Honor. Private Finney, Burton W.: Enlisted on 14-Apr-90 at Harrisburg, Pennsylvania, by Capt. Dodd. Assigned to troop to date Nov. 28, per Order 88, Headquarters 7 Cav. Camp at Pine Ridge Agency, S. Dak. Dec. 6, 90. Joined troop at Pine Ridge Agency, S. Dak. Dec. 6, ’90. Due U.S. Laundry 61 cents. Private Finney, Charles L.: Enlisted on 14-Apr-90 at Harrisburg, Pennsylvania, by Capt. Dodd. Assigned to troop to date Nov. 28, per Order 88, Headquarters 7 Cav Camp at Pine Ridge Agency, S. Dak. Dec. 6, 90. Joined troop at Pine Ridge Agency, S. Dak. Dec. 6, ’90. Due U.S. Laundry 89 cents. Private Fonsleth, Harry: Enlisted on 20-Oct-87 at Philadelphia, Pennsylvania, by Lt. Scott. On furlough since Nov. 1, ’90 per endorsement Headquarters Department of the Mo. Oct. 29, ’90. To forfeit to the U.S. $2.00 of his pay per Order 224 Fort Riley, Kansas, Nov. 2, ’90. Private Furman, Everet D.: Enlisted on 26-May-90 at Buffalo, New York, by Capt. Van Opsdah. Assigned to troop per paragraph I Order 92, Headquarters 7 Cav, Dec. 17, ’90 to date Nov. 28, ’90. On detached service at Fort Riley, Kansas, since Nov. 29, ’90. Due U.S. Laundry 80 cents. Due U.S. for jacket stores 35 cents. Private Gale, John: Enlisted on 11-Feb-87 at Philadelphia, Pennsylvania, by Lt. Scott. Private German, Henry: Enlisted on 5-Sep-88 at Detroit, Michigan, by Capt. Loud. Relieved from litter bearer by verbal order of post commander. Private Harris, Zachariah T.: Enlisted on 26-May-88 at Baltimore, Maryland, by Capt. Huggins. To forfeit to the U.S. $1.50 of his pay per Order 256 Fort Riley, Kans., Nov. 15, ’90. To Forfeit to the U.S. $5.00 of his pay per Order 257 Ft. Riley, Kans., Nov. 26, ’90. Deducted Nov. Rolls 90. Private Hayden, Francis H.: Enlisted on 8-May-89 at Brooklyn, New York, by Capt. Boyle. Private Hug, Gottfried: Enlisted on 7-Sep-87 at St. Louis, Missouri, by Capt. Smith. Private Imhoff, Jospeh: Enlisted on 17-Oct-89 at Detroit, Michigan, by Lt. Lockett. Private Jones, Albert J.: Enlisted on 1-Sep-90 at Detroit, Michigan, by Lt. Lockett. Assigned to troop to date Nov. 28 per Order 88 Headquarters. 7 Cav. Camp at Pine Ridge Agency, S. Dak. Dec. 6, 90. Joined troop Dec. 6, ’90 at Pine Ridge Agency, S. Dak. Due U.S. Laundry 49 cents. Private Keating, Patrick: Enlisted on 3-Jan-88 at Boston, Massachusetts, by Capt. Miller. Private Kemp, Willis A.: Enlisted on 19-Oct-89 at Cleveland, Ohio, by Capt. Carpenter. Relieved from litter bearer by verbal order of post commander. Private Klein, Michael: Enlisted on 17-Jan-87 at Cincinnati, Ohio, by Lt. Hunter. Private Livingston, Henry: Enlisted on 5-Jan-87 at Cleveland, O. by Lt. Vernon. On special duty as Asst. Cook since Nov. 27, 1890. Private Lockwood, John W.: Enlisted on 27-Aug-90 at Cleveland, Ohio, by Capt. Carpenter. Assigned to troop to date Nov. 28 per Order 88 Headquarters. 7 Cav. Camp at Pine Ridge Agency, S. Dak. Dec. 6, 90. Joined troop Dec. 6, ’90 at Pine Ridge Agency, S. Dak. Due U.S. Laundry 75 cents. Due U.S. for subsistence stores 17 cents. Private Marr, George: Enlisted on 23-Jul-88 at Springfield, Massachusetts, by Capt. Ropes. Private May, Patsey: Enlisted on 10-Jan-90 at Cincinnati, Ohio, by Capt. Haines. Assigned to troop to date Nov. 28 per Order 88 Headquarters. 7 Cav. Camp at Pine Ridge Agency, S. Dak. Dec. 6, 90. Joined troop Dec. 6, ’90 at Pine Ridge Agency, S. Dak. Due U.S. Laundry 75 cents. Private McCarbrey, Michael: Enlisted on 4-Jan-87 at Boston, Massachusetts. by Capt. McKeever. Private McDowell, James: Enlisted on 26-Mar-88 at Annapolis, Maryland, by Capt. Smith. Private McKibbin, Harold H.: Enlisted on 19-Sep-90 at Hagerstown, Maryland, by Capt. Rogers. Assigned to troop to date Nov. 28 per Order 88 Headquarters. 7 Cav. Camp at Pine Ridge Agency, S. Dak. Dec. 6, 90. Joined troop Dec. 6, ’90 at Pine Ridge Agency, S. Dak. Due U.S. Laundry 65 cents. Private Moran, Michael: Enlisted on 4-May-89 at Chicago, Illinois, by Capt. Porlan. Private Penninger, Theodore: Enlisted on 3-Aug-88 at Baltimore, Maryland, by Capt. Huggins. Private Porris, John B.: Enlisted on 12-Sep-88 at Baltimore, Maryland, by Capt. Huggins. On special duty as Cook since Nov. 27, 1890. Private Reese, Wilfred D.: Enlisted on 7-Oct-90 at Buffalo, New York, by Capt. Wilson. Assigned to troop to date Nov. 28 per Order 88 Headquarters. 7 Cav. Camp at Pine Ridge Agency, S. Dak. Dec. 6, 90. Joined troop Dec. 6, ’90 at Pine Ridge Agency, S. Dak. Due U.S. Laundry 36 cents. Due U.S. for subsistence stores 41 cents. Private Risse, Joseph: Enlisted on 17-Feb-87 at Fort Yates, Dakota Territory, by Capt. Haley. Private Smith, James A.: Enlisted on 20-Jul-88 at Philadelphia, Pennsylvania, by Lt. Scott. Private Steine, Allen M.: Enlisted on 22-Oct-88 at St. Louis, Missouri, by Lt. Guilfoyle. Sick in Hospital. From Oct. 22 to Nov. 2 90. “Gonorrhea” not contracted in line of duty. Sick in Hospital. From Nov. 8 to Nov. 23, ’90. “Retention of urine” not contracted in line of duty. Absent sick at Fort Riley, Kans, since Nov. 24, 90. ¥ Private Sullivan, Thomas: Enlisted on 20-Sep-89 at Newark, New Jersey, by Lt. Carter. Granted a Medal of Honor. Private Sullivan, Tim: Enlisted on 10-Apr-90 at Boston, Massachusetts, by Capt. Kendall. Private Tague, John V.: Enlisted on 21-Apr-90 at Providence, Rhode Island, by Capt. Thompson. Relieved from detail duty in post garden by verbal order of Post Commander. Private Thompson, Harry: Enlisted on 22-Jul-90 at Camden, New Jersey, by Capt. Rogers. Assigned to troop to date Nov. 28 per Order 88 Headquarters 7 Cav. Camp at Pine Ridge Agency S. Dak. Dec. 6, ’90. Absent sick at Fort Robinson, Neb. From Dec. 2 90 to Jan’y 3 91 with incised wound back of right hand con. In line of duty. Private Young, Edward: Enlisted on 11-Jul-88 at Newark, New Jersey, by Lt. Carter. ¥ Private Ziegner, Hermann: Enlisted on 21-May-86 at Baltimore, Maryland, by Capt. Parke. Transferred from troop I, 7 Cav. Per paragraph I Order 84 Headquarters 7 Cav. Fort Riley, Kans., Nov 20, 90. Joined troop at Ft. Riley, Kans., Nov. 20, ’90. On special duty as troop clerk since December 1, 1890. Sergeant Bengs, August H.: Enlisted on 28-May-87 at Fort Buford, Dakota Territory, by Lt. McGinnegle. Troop L, 7 Cav. Attached to troop E, 7 Cav. since Sept. 9, 90, per paragraph I Order 67 Headquarters 7 Cav. Sept. 9, 90. Private Busk, Ingebigt L.: Enlisted on 26-Aug-87 at St. Louis, Missouri, by Capt Smith. Discharged at Fort Riley, Kans., Nov. 25, 90 per paragraph 2 Special Order 150 Headquarters Department of Mo Oct 30, 90. under provisions of General Order 80 of Adjutant General’s Office. Discharge and final statements forwarded by registered mail to Wichita Falls, Texas. Receipt received. Character “Excellent.” Single Due soldier for clothing not drawn in kind $15.32. Pay due as Corporal from July 1 to Aug 31 and as Private from Sept 1 to Nov. 25, 90. On furlough from Sept 1, 90 to Nov. 25, 90, per paragraph 6, Special Order 114 Headquarters Department of Missouri Aug. 25, 90. Private Foster, Charles: Enlisted on 8-Sep-87 at Chicago, Illinois, by Capt. Hennesee. Discharged at Camp at Pine Ridge Agency, S. D. Dec. 7, 90, per paragraph 2 Special Order 161 Headquarters Department of Mo Nov. 21, 90, under provisions of General Order 80 Adjutant General’s Office. Discharge and final statement forwarded by registered mail to 53 Locust Street, Chicago, Ills. Receipt received. Character “Good” Single. Due soldier for clothing not drawn in kind $9.35. On furlough from Sept. 7 to Dec 7, 90 per paragraph 6 Special Order 114 Headquarters Department of Missouri, Aug. 25, 90. Private German, George H.: Enlisted on 9-Sep-87 at Detroit, Michigan, by Capt. Loud. Discharged at Camp at Pine Ridge Agency, S. Dak. Dec 8, 90 per paragraph 2 Special Order 161 Headquarters Department of Mo Nov. 21, 90 under provisions of General Order 80 Adjutant General’s Office. Discharge and final statement forwarded by registered mail to Junction City, Kans. Receipt received. Character “Good” Single. Due soldier for clothing not drawn in kind $57.56. Pay due as Sergeant. from Sept 1 to Sept 19 both inclusive and from Sept. 20 to Dec. 8, both inclusive as Private. On furlough from Sept. 16 to Dec. 8, 90 per paragraph 6, Special Order 114 Headquarters Department of Missouri Aug. 25, 90. Private German, Walter L.: Enlisted on 9-Sep-87 at Detroit, Michigan, by Capt. Loud. Discharged at Camp at Pine Ridge Agency, S. D. Dec. 8, 90 per paragraph 2 Special Order 168 Headquarters Department of Mo, Dec. 6, 90 under provisions of General Order 80 Adjutant General’s Office. Discharge and final statement forwarded by registered mail to 212 West 2nd Street, Sedalia, Mo. Receipt received. Character “Good” Single. Due soldier for clothing not drawn in kind $21.27. On furlough from Sept. 16 to Dec. 8, ’90 per paragraph 6 Special Order 114 Headquarters Department of Missouri Aug. 25, ’90. Private Segerbund, Charles: Enlisted on 12-Sep-87 at Chicago, Illinois, by Capt. Hennesee. Discharged at Camp at Pine Ridge Agency, S. Dak. Dec. 11, ’90, per paragraph 2 Special Order 161 Headquarters Department of Mo Nov. 21, 90 under provisions of General Order 80 Adjutant General’s Office. Discharge and final statement forwarded by registered mail to St. Charles, Ills. Receipt received. Character “Excellent” Single. Due soldier for clothing not drawn in kind $30.94. Pay due as Corporal. from Sept. 1 to Sept. 19, ’90 both inclusive and from Sept. 20 to Dec. 11 both inclusive as a Private. On furlough from Sept 16 to Dec. 11, 90 per paragraph 6, Special Order 114 Headquarters Department of Missouri, Aug. 25, 90. Private Schroder, William: Enlisted on 12-Sep-87 at St. Louis, Missouri, by Capt. Smith. Discharged at Camp at Pine Ridge Agency, S. Dak. Dec. 11, ’90 per paragraph 2, Special Order 163, Headquarters Department of Mo Nov. 26, ’90 under provisions of General Order 80 Adjutant General’s Office. Discharge and final statement forwarded by registered mail to Fort Riley, Kans. Receipt received. Character “Excellent” Single. Due soldier for clothing not drawn in kind $18.37. On furlough from Sept. 16 to Dec. 11, ’90 per paragraph 6, Special Order 114 Headquarters Department of Missouri, Aug 25, 90. Private McCaughna, George B.: Enlisted on 13-Sep-87 at Detroit, Michigan, by Capt. Loud. Discharged at Camp at Pine Ridge Agency, S. Dak. Dec. 12, 90 per paragraph 2 Special Order 161 Headquarters Department of Mo. Nov. 21, ’90 under provisions of General Order 80 Adjutant General’s Office. Discharge and final statement forwarded by registered mail to Junction City, Kans. Character “Excellent” Single. Receipt received. Due soldier for clothing not drawn in kind $7.59. On furlough from Sept. 16 to Dec. 12, ’90 as per endorsement Headquarters Department of Missouri, Sept 2, ’90. § Sergeant Nettles, Robert H.: Enlisted on 20-Jun-86 at Fort Meade, Dakota Territory, by Lt. Wilkinson. Killed in action against Hostile Sioux Indians at “Wounded Knee Creek” S. Dak. Dec. 29, 1890. Due soldier for clothing not drawn in kind $26.79. Due soldier retained $54.30. Buried at Pine Ridge Cemetery, S. Dak. 31 Dec. 90 Grave No. 13. § Private Kellner, August: Enlisted on 19-Sep-90 at Fort Leavenworth, Kansas, by Lt. Hughes. Killed in action against Hostile Sioux Indians at “Wounded Knee Creek” S. Dak. Dec. 29, 1890. Due soldier for clothing not drawn in kind $13.10. Due soldier retained pay $13.33 1/3 Buried at Pine Ridge Cemetery, S. Dak. 31 Dec. 90 Grave 14. Corporal Spring, Thomas: Enlisted on 3-Aug-88 at Cleveland, Ohio, by Capt. Kellogg. Transferred to troop B, 7 Cav. As a private per Order 84. Headquarters 7 Cavalry Fort Riley, Kans., Nov. 20, 1890. Due soldier for clothing not drawn in kind June 30, 90. $15.15. Hossay value of clothing drawn since last settlement $2.56. Character “Very Good.” Single. ¥ Sergeant McMillan, Albert W.: Enlisted on 15-Aug-87 at Jefferson Barracks, Missouri, by Lt. Fountain. Transferred to the H.Q. Staff and appointed Sergeant Major of the regiment to date Dec. 30, 90 per Order 95. Headquarters 7 Cav. Camp at Pine Ridge Agency S. Dak. Dec. 30, 90. Due soldier for clothing not drawn in kind to date Dec. 31, 90 $26.06. Character “Excellent” Single. Private Farrell, George D.: Enlisted on 18-May-89 at Chicago, Illinois, by Capt. Nowlan. Reverted from Wagoner to Private to date Nov. 1, 90 per Order 16 troop Fort Riley, Kansas Nov. 10, 90. Deserted at Fort Riley, Kans. Nov. 12, ’90. Due U.S. for Ordnance and Ordnance stores $13.50. The Recapitulation and Record of Events Page of E Troop, 7th Cavalry Regiment’s Muster Roll of December, 1891. Record of Events Which May Be Necessary or Useful for Future Reference at the War Department, or for Present Information. The troop performed the usual garrison duty at Fort Riley, Kansas form Nov. 1 to Nov. 23, 90 inclusive. In the field since Nov. 24, ’90. Left first by rail, arrived at Rushville, Neb. Nov. 26, ’90. Marched overland Nov. 26, ’90, camped at Water Lake. Distance marched 12 miles. Marched from Camp at Water Lake Nov. 27, to Pine Ridge Agency, S. Dak. Distance marched 16 miles. Total Miles marched 28. In camp at Pine Ridge Agency from Nov. 27 to Dec. 28 ’90. Left Camp at Pine Ridge Agency and marched to “Wounded Knee Creek” S. Dak. distance 17 miles. The troop was engaged with hostile Sioux Indians at “Wounded Knee Creek” S. Dak. December 29, 1890. Two men killed and one wounded and 2 horses killed in action. The troop left camp at “Wounded Knee Creek” S. Dak. 4 P.M. the 29th inst. and marched to Pine Ridge Agency, S. Dak. arriving there at about 11 P.M. the 29th inst. The troop was engaged with Hostile Sioux Indians in “Bad lands” about 9 miles north of Pine Ridge Agency, S. Dak. December 30, ’90. One horse slightly wounded in action. In Camp at Pine Ridge Agency. Source: Adjutant General’s Officer, “7th Cavalry, Troop E, Jan. 1885 – Dec. 1897,” Muster Rolls of Regular Army Organizations, 1784 – Oct. 31, 1912, Record Group 94, (Washington: National Archives Record Administration). 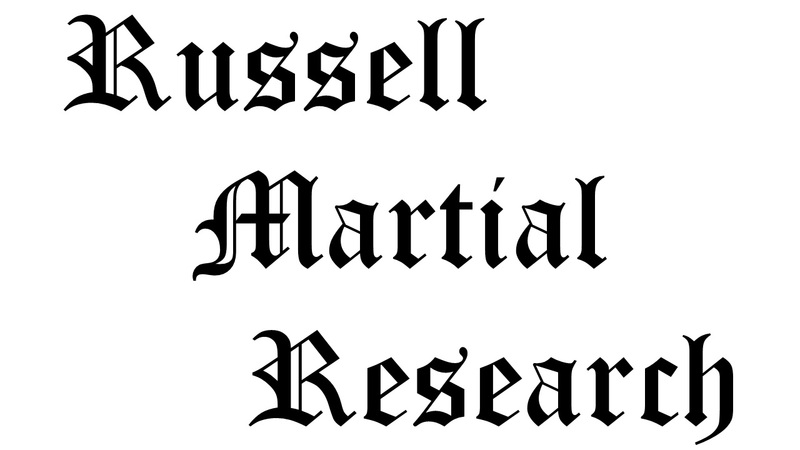 Citation for this article: Samuel L. Russell, “E Troop, 7th Cavalry Regiment Muster Roll,” Army at Wounded Knee (Sumter, SC: Russell Martial Research, 2013-2014, http://wp.me/p3NoJy-xu), posted 17 Sep 2014, accessed _______. 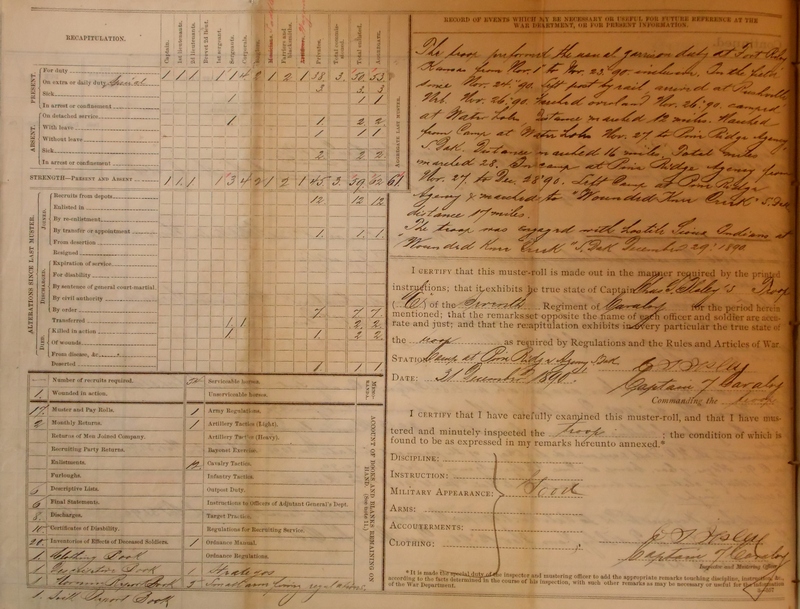 This entry was posted in Muster Rolls and tagged 7th Cavalry, 7th Cavalry Regiment (United States), Battle of Wounded Knee, Cavalry, Cavalry Troop, Department of the Missouri, Drexel Mission, Fort Riley, Ilsley, Pine Ridge, Pine Ridge Agency, Pine Ridge Indian Reservation, Sioux, Wounded Knee Creek, Wounded Knee Massacre. Bookmark the permalink.